Removes all internal wires having area less than specified min area. Clear all sequences and temporary map;. Removes all internal wires having area less than area specified as minimal allowed area. 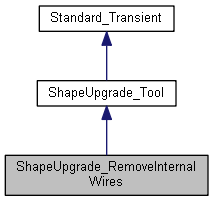 If specified sequence of shape contains - 1.wires then these wires will be removed if they have area less than allowed min area. 2.faces than internal wires from these faces will be removed if they have area less than allowed min area. Returns sequence of removed faces. Set mode which manage removing faces which have outer wires consisting only from edges belonginig to removed internal wires. By default it is equal to true. Queries status of last call to Perform() : OK - nothing was done :DONE1 - internal wires were removed :DONE2 - small faces were removed. :FAIL1 - initial shape is not specified :FAIL2 - specified sub-shape is not belonged to inotial shape.